"It was a very surreal moment for me. I checked into the game and I see all my buddies on the other side of the court." 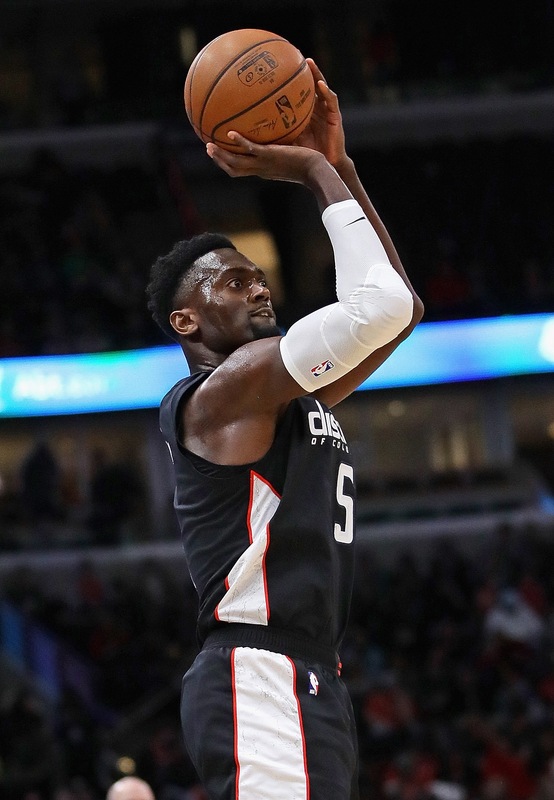 Bobby Portis, big eyes and an even bigger heart, used to joke when he was struggling for two years to even make it into the Bulls rotation, still taking a G-league tour in his second season with the Bulls, about having t-shirts and signs made that read, "Free Bobby Portis." Portis would laugh, the unusual player who was considered a team leader even though he wasn't playing much. But no one practiced like Bobby did, made the gym his home, his home the stopover on the way back to the gym. So late Saturday night after Portis came off the bench for 10 points and 12 rebounds in his Washington Wizards 134-125 victory over no longer his Bulls, he was asked about the slogan. Bobby's eyes smiled, and you know that's a welcoming look. "I'm free now," he laughed. Portis along with Jabari Parker are with the Wizards now after Wednesday's surprising trade for Washington's Otto Porter Jr. The rare confluence of traded players occurring so quickly Saturday saw Porter with 17 points and a pair of steals in his usual workmanlike game and Parker with an angrier 20 points and a half dozen dunks. "Just a great moment to beat our friends," Portis was telling Chicago reporters after the game. He was wearing a bright, cherry-colored suit with dangling chains that brightly sparkled, one with his BP initials and another with the words Under and Dog vertically. Not that he needs the reminder, but it's also who he is and where he is from. Both physically and mentally. "We put a lot of time into this," Portis said. "This is our job. It was a big moment for us. We got traded and wanted to win this game really bad. Jabari, that's who he is, slashing, getting to the rim. Coach (Scott) Brooks does a great job of putting us in the right spots where we can score. He knows our spots and strengths. He uses them really well. He wants us to be ourselves." Little chance there are many like Bobby Portis, the 6-11 forward who isn't going to be one of your leading men on a championship team. Very good player, but the Bulls decided to shuffle their deck a bit more amidst the decline to a rebuilding project since Portis was drafted No. 22 overall in 2015. None of it was the fault of Portis, who came on board as the Bulls were beginning their descent, Derrick Rose and Joakim Noah in their final seasons onto Jimmy Butler joining up with Dwyane Wade and Rajon Rondo to the start of a rebuilding with the trade for Zach LaVine, Lauri Markkanen and Kris Dunn and beginning to sort all of that out this season with a coaching change. It's hardly the ideal environment for a tough kid who was once so angry coaches didn't believe he could be productive. He idolized the U. of Arkansas 40 Minutes of Hell game, and sort of lived this life like that, saving his mother and family from an abusive male in a direct confrontation, starring as SEC player of the year and onto the draft and the Bulls. Whom he fell in love with as he often told the story of coming to Chicago for predraft workouts and not wanting to leave, attending the dramatic Bulls playoff win over the Cavaliers in 2015 on Rose's winner, certain that Chicago was his destiny. But the 6-11 Portis was more intense grinder than high flier, a player who gained his edge more with a blue collar than a fancy cape. There was no jumping ahead in the line. So he had to wait his turn and work, behind Noah and Taj Gibson, Nikola Mirotic and Pau Gasol and various incarnations of messages. Don't shoot, shoot. Rebound; that's not enough. Work and you'll be rewarded. Although we are looking for another free agent at your position. "I think the one thing I'll remember most is just me learning how to be patient," Portis said. "I've always been the guy on my team to be the No. 1 option. I've always been the guy that's been the best player on my team. When I got here, I had to sit and wait my turn. It was tough right off. It taught me patience. I got hurt. I had to be patient again. Everything comes full circle. I don't have anything bad to say about anybody here. Everybody treated me really well, with open arms. They treated me like family here. This is a great place to play for any player who wants to come play here. They treat you like family. That's what I'll always remember." Portis was beloved by teammates. They quickly named him "crazy eyes" for his intense, big eyed look. But they also sought his protection. When Wade bashed the young players in a late season rant, it was Portis who stood up for the team the next day in a meeting and called out Wade for not working as hard as they do. Wade's talent was superior to theirs, but he wasn't one to question their work ethic. Still, there were obstacles. And when Mirotic was about to be the next to push him out of the rotation last season and by many accounts was taunting Portis, there was an explosion and Mirotic's face was shattered. Portis was suspended eight games, and he came back contrite. He apologized profusely. He was embarrassed. Mirotic refused to forgive him, but his teammates never doubted. They knew who Bobby was. It complicated things some as many outside the team saw Portis as the problem; teammates saw him as an answer. Portis returned and teaming with Mirotic, the Bulls played the best they did last season, winning 10 of 12. Soon, however, Mirotic was traded. Portis with his first regular role began to bloom in spring like Mirotic once would. Portis had a career-high 38 points against the 76ers and averaged about 14 points and eight rebounds the last two months. He pounded his chest and flexed his muscles on baskets. "I'm an emotional player," Portis said back then. "I flex a lot, try to get the crowd in with the antics; something I've been doing all my life, trying to get the crowd involved. I feel like with the second unit it is my unit to try to help the team score. I like that role. Just me believing in myself. I've always been a guy not highly talked about; always had people doubting me. But I believe in myself and my abilities." Portis was ready to dive into this season. He set a goal to win the Sixth Man award as it seemed he finally was established. And then in the fourth game of the season against Charlotte, he came limping out with a serious knee sprain. Then back after a month, out again with an ankle injury, back, out again with an elbow. He'd rejected a contract extension before the season, and it just didn't seem to be going as it should. Still, Portis was stunned when perhaps a half hour before Wednesday's game with the Pelicans he learned he was traded. He left the arena immediately. "I think everybody knows how much I prided (myself) playing for the Bulls and prided (myself) playing for the city of Chicago," Portis said post game. "I think that's known by everybody in the Bulls organization. Obviously, I got my first taste of the business side of basketball. You don't really get your way all the time. It's not really your choice. I have to roll with it now. I was hurt the last 48 hours. But when I got into the game (Friday with 30 points against Cleveland), those hurt emotions went away. "I didn't see it coming," Portis acknowledged. "I was seeing all the things on Twitter. People kept (contacting) me. I thought it was just rumors and stories. I never thought I would get traded. But it's basketball. I think I did a good job of just taking it the right way and moving on. I'm with an organization now that really likes me." The Bulls liked Bobby, too. They played a tribute video for he and Parker in the first quarter of Saturday's game. "I don't like to really show my emotions that way to the public," Portis admitted. "But it was a great feeling just to have a tribute video. I feel like I put in a lot of hours, time, blood, sweat and tears into playing for the Bulls. It was tough for me. I've moved on now. But I will never forget those three and one half years I had wearing No. 5 for the Bulls." Portis spent a long time after the game sharing hugs with former teammates, his greeting with Robin Lopez the longest and dearest as the two shared favorite handshake greetings as well. Portis went to the Bulls locker room to greet staff before the Wizards left. "It was very weird," Portis said about the scene. "I'm sitting there hearing the starting lineups, hearing their famous song around the world, hearing that. And I just imagined myself getting ready to play somebody else and not the Bulls. It was a very surreal moment for me. I checked into the game and I see all my buddies on the other side of the court. Also weird. It was just a weird night for me overall. "I don't have any regrets," Portis added. "I feel like I'm playing some good basketball right now. My confidence is back. It's fun to play and compete and knowing we have a goal in making the playoffs. That's our main focus. I want to thank you (media) guys, too. Y'all are some good dudes. You guys have put great stories for me over the years. I want to thank you as well. It's kind of weird going to another organization and seeing new reporters. I kind of cherish you guys, too." C'mon, really. Who says that? Portis turns 24 Sunday. 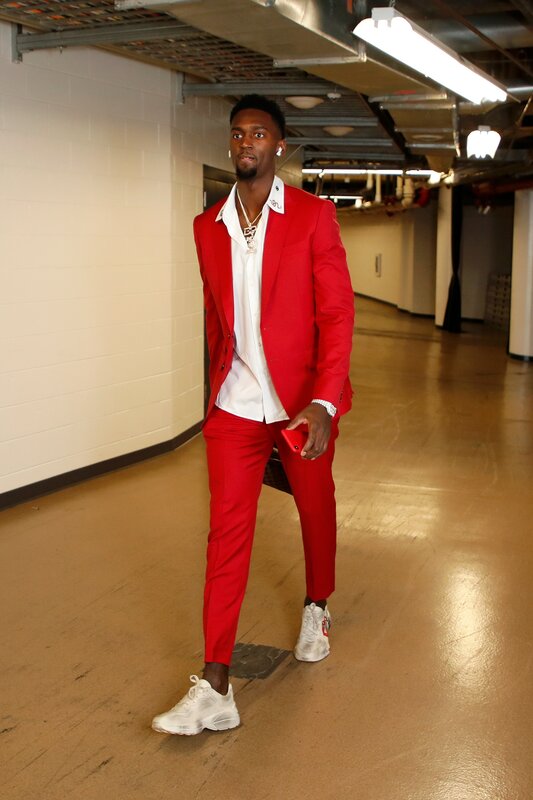 He said he wore the bright red suit as his own party outfit. "It's my birthday tomorrow. 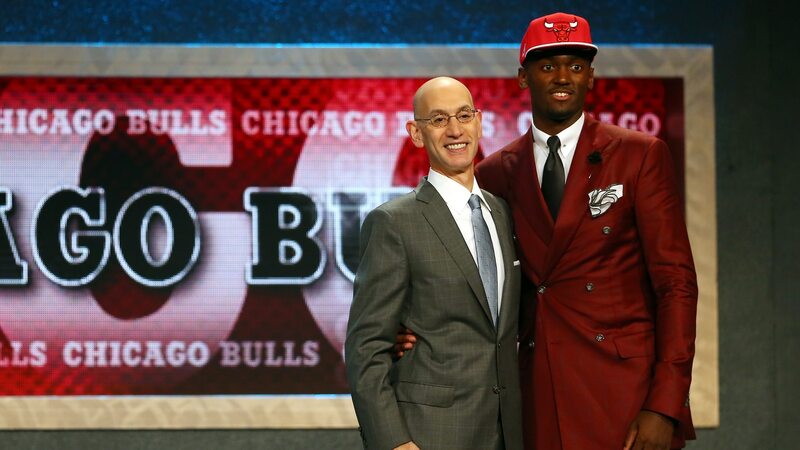 so just wanted to wear red, a little Bulls red," Portis said with a smile a bit more shy. "I think that's pretty known." There'll always be a little bit of Bulls behind those big, welcoming eyes.